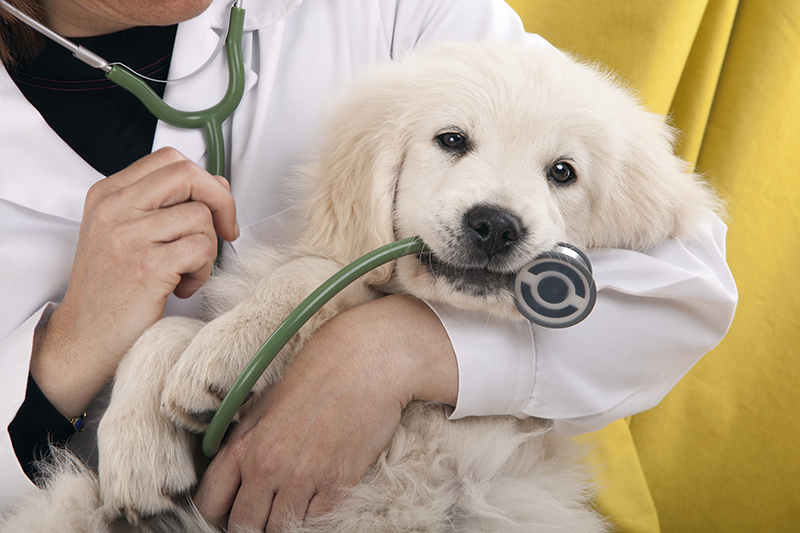 Does your pet get anxious as soon as they catch sight of our clinic? Fear and anxiety are problems we encounter daily. Does your pet seems to know when they’re headed our way, even though you haven’t even left the house yet? When normally your pet enjoys a car ride, does coming to see us prompt shaking and panting, perhaps even hiding under the front seat? When they arrive, does the nervousness increases ten-fold? The largest dogs always find a way to fit under the chairs in the exam room! Keep cats and dogs separate during exams: You may have noticed that we added a third exam room at the east end of our lobby. Although it’s a smaller room, we have reserved it for cats only. That way we try to keep your kitty away from the smells and sounds of dogs as much as we can. There are cat-friendly adaptations in that room, too, such as soft places to curl up, and a window seat to look outside – we’ll even do your kitty’s exam on it! We also use Feliway in our cat room, a cat-specific calming pheromone. Being timely: As much as we are able, we strive to get you and your pet into an exam room as soon as you enter the clinic. That way, you and your pet do not have to sit in the lobby waiting, which can present stress to your pet in the form of other pets being around, as well as adding to your stress (which in turn can stress your pet!) Our technicians aim to get into the room and get history-taking done, and get the doctor in to do their exam and treatments, so that we don’t keep you here any longer than is necessary. Use of treats: We often utilize treats to distract your pet during stressful or uncomfortable procedures. We generally have a couple different varieties that we offer, trying to entice your pet to pay attention to the treat versus what we are doing. However, you may notice that your pet is even too stressed to take a treat, until they realize that the exam portion of their visit is over. Sedation: We may recommend a mild sedative for your pet for certain procedures, or even just to make a routine appointment less of an ordeal for an overly-stressed pet. Please ask us about this, if you think it would help your pet. Bring pets hungry: If your pet is hungry, they’re much more apt to accept treats as distraction. De-stress the carrier: Keep your carrier out and around at home. Feed treats there, put toys in it, put a favorite blanket or pillow in it to encourage napping there, and spray it with pheromones such as Adaptil (for dogs) or Feliway (for cats). Here is a great video explaining how to de-stress the carrier. Bring a calming item, if your pet uses one at home: Items like Thundershirts, a favorite blanket or toy, or even a preferred owner, can help reduce stress in a worried pet. Acclimate nervous pets: If your pet is always nervous about coming to the clinic, we encourage you to stop by more frequently (every few weeks, for instance) for non-stress visits. Let us know that you’d like to do this, and every time you stop by we’ll give your pet a scratch or a treat, to let them know that not every visit is a cause for concern. We look forward to seeing you and your pet at your next visit!